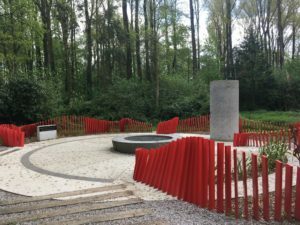 The Passchendaele Society is proud to have been involved as Project Leader for the New Zealand Memorial & Garden at the Memorial Museum Passchendaele 1917 in the village of Zonnebeke, Belgium. 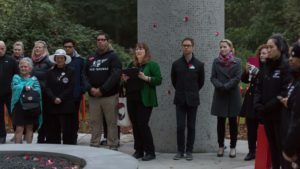 The Maori name is: ‘Nga Pua Mahara – The Petals of Remembrance’ – “Pua” is also a seed or flower and, in that way, represents hope for peace in the future. 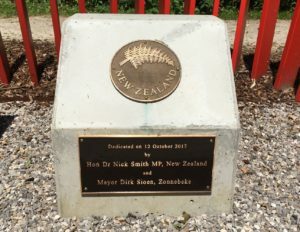 The area around the villages of Zonnebeke and Passchendaele in the province of Flanders is of immense significance to New Zealand and its involvement in World War I. 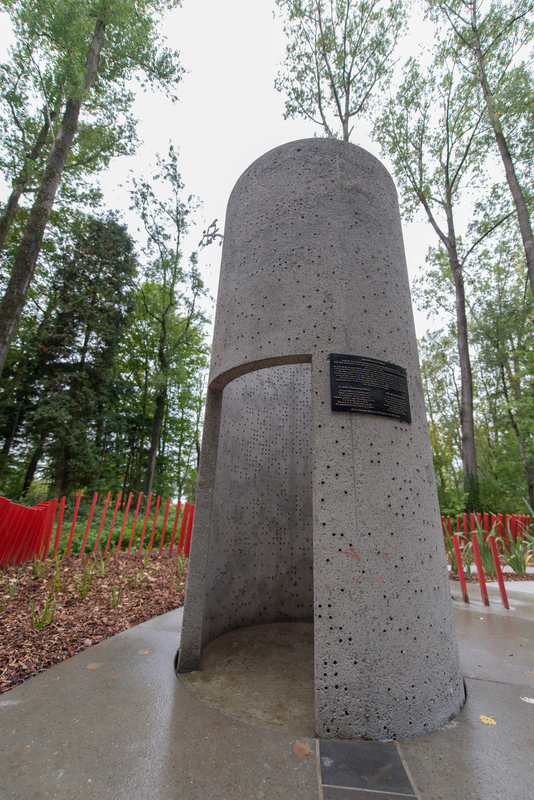 The New Zealand Memorial & Garden has been created in remembrance of the more than 5000 New Zealanders who were killed or mortally wounded in the series of battles leading to the Battle of Passchendaele. Most still lie in the surrounding Flanders Fields, Belgium. Others made it south over to the border only to die at a later date in a Field Dressing Station or hospital and are thus buried in French soil. They are all remembered here at this permanent memorial, Lest we Forget! 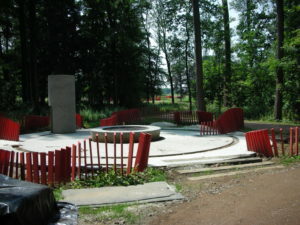 The Passchendaele Memorial Park has been created in the grounds of the Zonnebeke Chateau, next door to the museum. 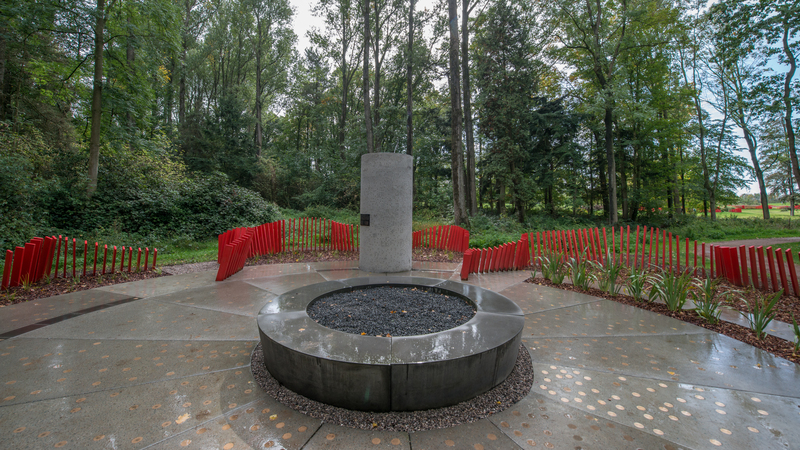 The Park includes seven small gardens designed to represent each nation involved. The gardens are all in the shape of a poppy when seen from the air. 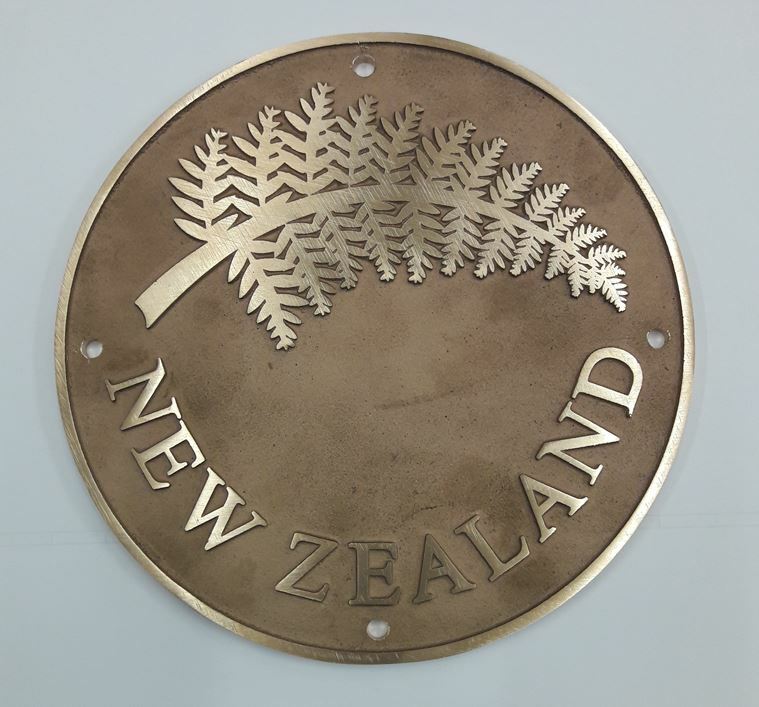 The winning design for New Zealand was submitted by Cathy Challinor of Boffa Miskell, a prominent design practice in New Zealand. 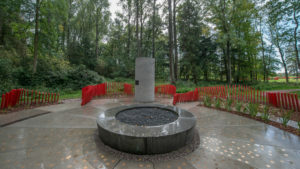 The New Zealand Memorial & Garden will undoubtedly become the focal point for future commemorations (click on the photos to enlarge). 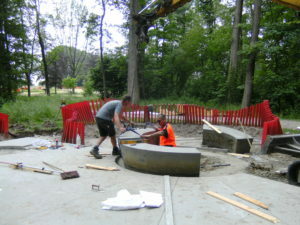 The following entries are Blogs that captured the progress of the Memorial & Garden. 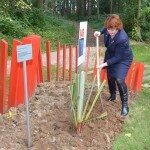 The ‘Dedication’ plaque is the final addition to the Passchendaele Memorial & Garden to record the official opening. 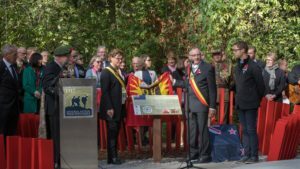 We wish to sincerely thank the Lotteries Commission for supporting the Passchendaele Society financially with this project. 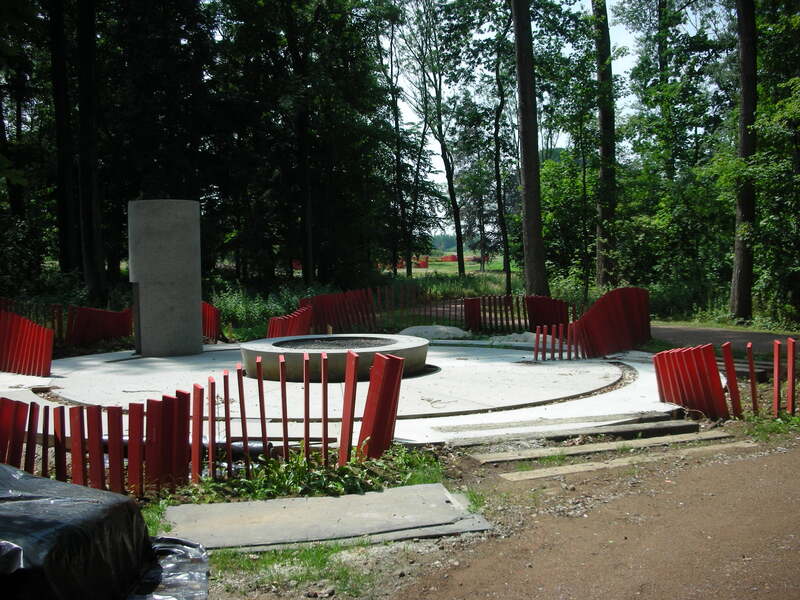 We also wish to thank the Memorial Museum Passchendaele 1917 for their generosity and on-going upkeep of New Zealand’s Memorial & Garden. We have been informed by the Passchendaele Memorial Museum in Zonnebeke that the New Zealand plants in the garden had no trouble surviving the winter and are starting to grow again and the gardeners are keeping an eye on weeds coming out. 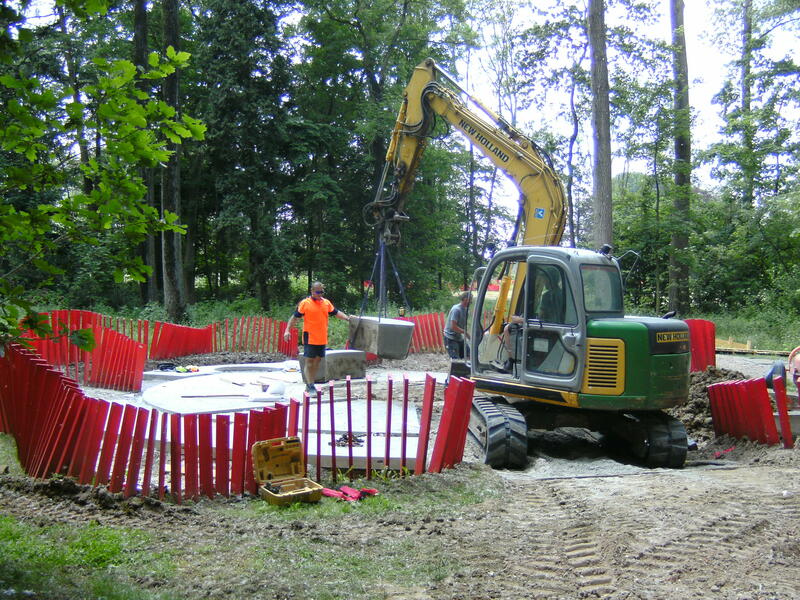 They are currently working on a forest management plan for the woodland around the garden, which will see many of the poplars cut down allowing the other trees to fully grow into a mixed, natural deciduous forest. The poplar that holds the Ruru will remain. 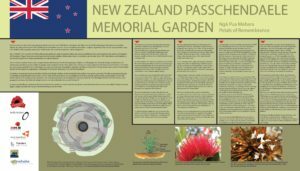 The Passchendaele Society is proud to announce the release of our Video Documentary of the story of the New Zealand Memorial & Garden – Nga Pua Mahara (The Petals of Remembrance) from conception through to completion and opening on 12th October 2017. Please click on the link below to view the documentary. 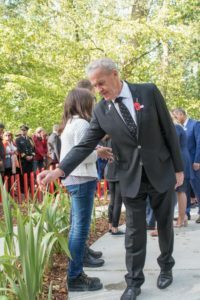 THE highlight of the Centennial commemorations in Flanders was for many the official opening of the New Zealand Passchendaele Memorial & Garden. It was a privilege to be able to attend and to be part of such a moving ceremony, which was extremely well organised by Chris Mullane with hundreds of hours that went into planning the event. The weather was beautiful and the location really is a magical spot. The official opening proved to be a most memorable occasion with Chris as Master of Ceremonies. 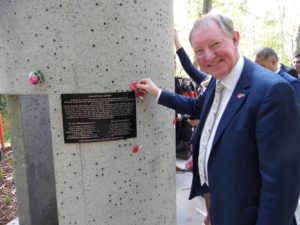 More than five hundred guests participated in a uniquely New Zealand experience which followed a theme of remembrance through planting, through art and through literature. 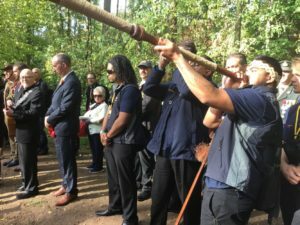 Dignitaries including the Honourable Nick Smith MP, the Right Honourable David Carter MP, Auckland Mayor the Honourable Phil Goff , Zonnebeke Mayor Dirk Sioen and Willie Apiata VC were led into the garden by the Maori Cultural Party. Opening introductions and speeches were delivered by Board Member Lode Notredame in Flemish and by Vice President Chris Mullane in English. 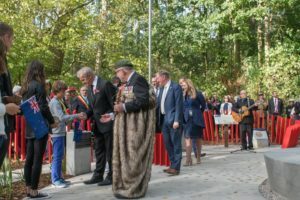 Mayor Sioen in turn officially transferred ownership of the ground from the Zonnebeke Council to New Zealand and this was gratefully acknowledged by the Honourable Nick Smith MP before he and Mayor Sioen opened the garden. Traditional maori instruments were played to reproduce the bird calls of the native bird sculptures installed in the garden. 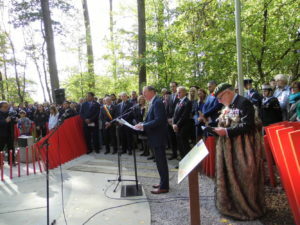 The ode for the fallen was recited in Flemish by Freddy Declerck MNZM, in Maori by NZDF Cultural Advisor Navy Warrant Officer Jack Rudolf and in English by Passchendaele Society member Defence Attaché Captain Shaun Fogarty, MNZN, RNZN. 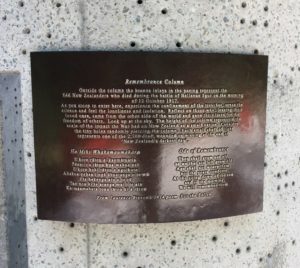 Following on the theme of remembrance New Zealand soil from Pukeahu Memorial Park was sprinkled over the garden and in so doing followed the Maori proverb “provide me with a handful of soil from my native land so that I may feel the warmth of my ancestors and weep”. 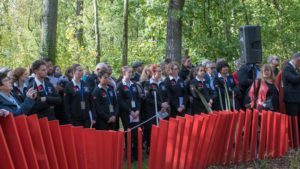 Member Max Laloli coordinated the young New Zealanders from the Passchendaele Society competition, the New Zealand Defence Force Young Ambassadors and Belgian children from local schools into the programme. Musical items of the highest quality were provided by Dave Dobbyn ONZM and AMus Rebecca Nelson. 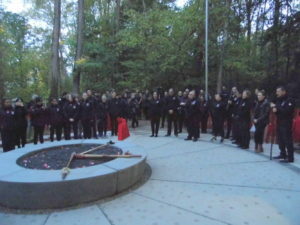 The ceremony concluded by handing over the care of the garden to Memorial Museum Passchendaele as kaitiake (guardians). 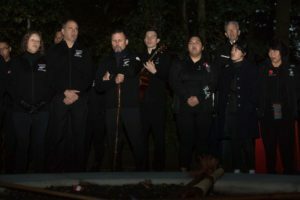 This morning a dawn blessing ceremony was performed on site of the Nga Pua Mahara (Petals of Remembrance) – New Zealand Passchendaele Memorial & Garden in Zonnebeke by Toi Maori Aotearoa and involved the burying of a Maori spirit stone (mauri) from the Waitangi Treaty Grounds. 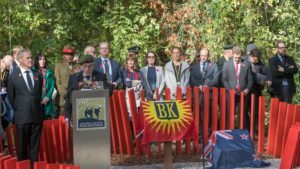 Local dignitaries, New Zealand Defence Force representatives and Passchendaele Society Board Members attended this ceremony. 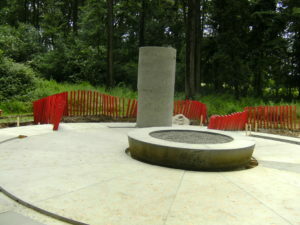 Below you can see a couple of pictures of the New Zealand Memorial and Garden. 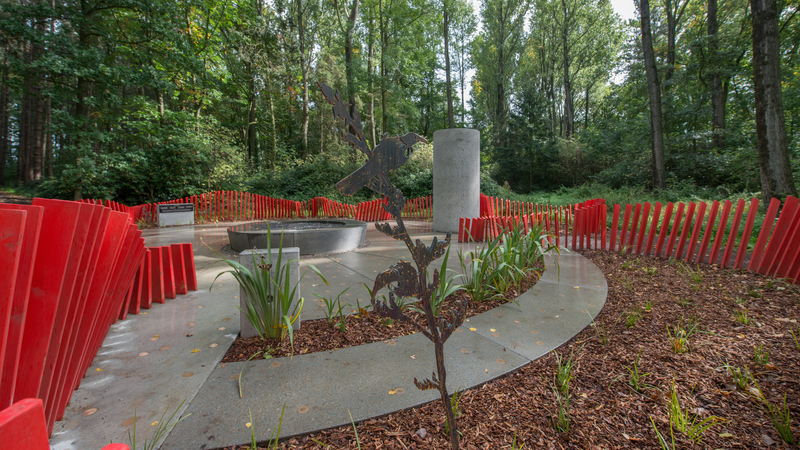 The planting has now been completed and the metal birds have been added. We are thrilled with the final result after many years of hard work to get it to this stage. We are looking forward to the official opening at 3pm on October 12th. 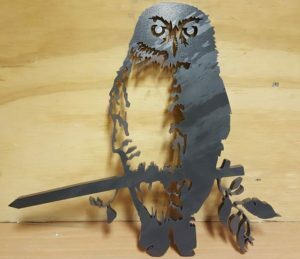 A last minute addition to our Memorial and Garden are some life size metal birds, including our native Kereru (Wood pigeon), Piwakawaka (Fantail), Tui and Ruru (NZ native owl) which will act as the Kaitiaki/Guardian of our M&G. The Belgian Skylark is also represented, the bird was often heard singing above the battlefield during a lull in fighting. A bronze plaque has also been made for the entrance. It depicts the silver fern and NEW ZEALAND as featured on every New Zealand soldier’s headstone. 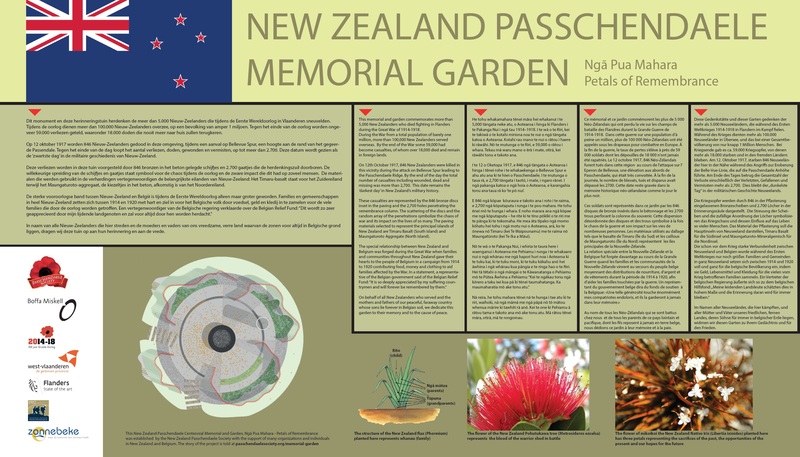 Below is the final version of the Information Panel which will be installed at the entrance to our Passchendaele Centennial Memorial and Garden, Nga Pua Mahara – Petals of Remembrance. The word panels are translations of the English version into Dutch/Flemish, Te reo Maori, French & German. Note that Belgium has had a very dry summer so, following professional advice, we have decided to delay the planting until September. Anyone visiting prior to September will find everything else complete but no planting. We are thrilled to have received some photo’s on the progress of the New Zealand Memorial and Garden at the Zonnebeke Chateau grounds. The pavers have been laid and the column has been erected. 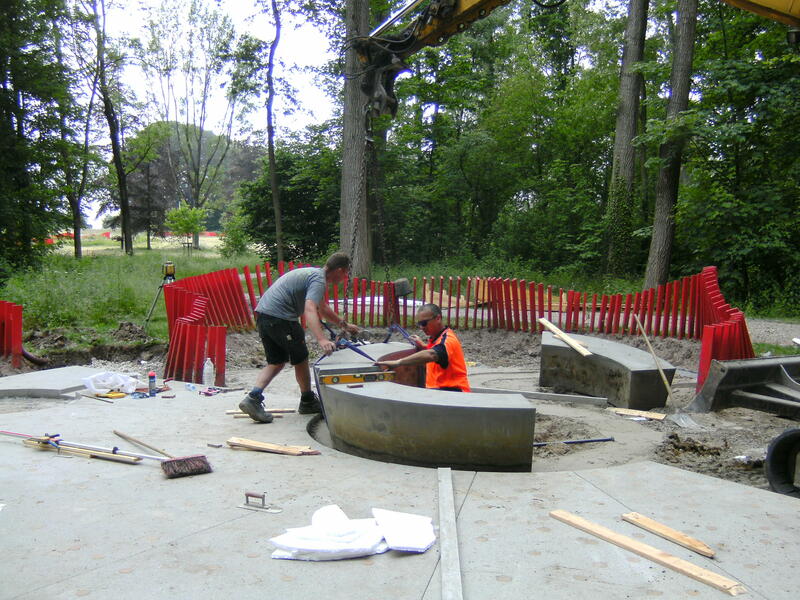 The planting will take place from early next week and the bronze inlays will soon be put in place. The five shipping containers we farewelled on 14 March arrived in Antwerp today. 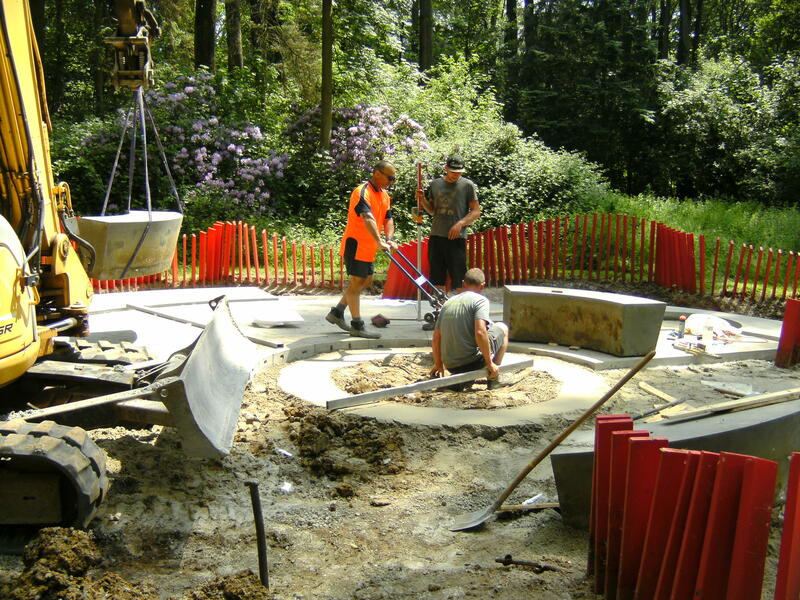 Jagas Paving is representing us in Belgium, they will be on site at Zonnebeke for the week commencing 24th May to supervise the installation of the NZ sourced paving (both the Timaru Basalt & the pre-cast Maungaturoto Aggregate paving segments). 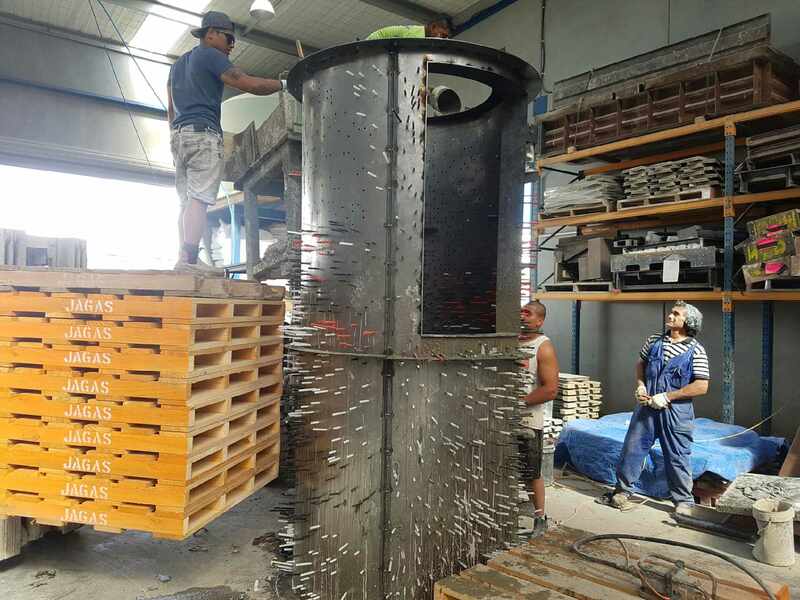 They will also oversee the laying by our Belgium contractors of the in-situ constructed paving which will incorporate the stocks of loose Maungaturoto aggregate we shipped to Belgium. 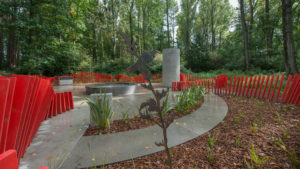 It has now been confirmed with Auckland Council that the Dawn Ceremony & Blessing to Farewell the NZ Passchendaele Memorial and Garden shipping containers will take place on Tuesday, 14 March 17. Outline: The event will be about 30 minutes duration and will include a Maori blessing and relevant veteran rituals (a bugler & a piper, etc.). This will be a low-key event observing appropriate protocols for the start of this historic journey which evokes the similar journey undertaken by New Zealanders going to World War I a hundred years ago. It can be seen as a ‘curtain raiser’ for the forthcoming year of events commemorating the centenary of Passchendaele and there is already strong media interest in the dawn event. Tea/coffee, etc. will be served on site after the ceremony. 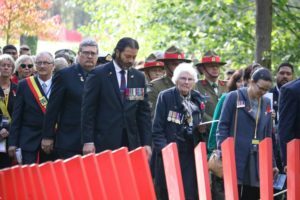 Organization: The event will be jointly hosted by the Passchendaele Society and Auckland Council, with support from AWMM. Photo one shows the form work with the pins which will create the 2,700 bullet holes. NB: the form work is upside down and the door is at the top. 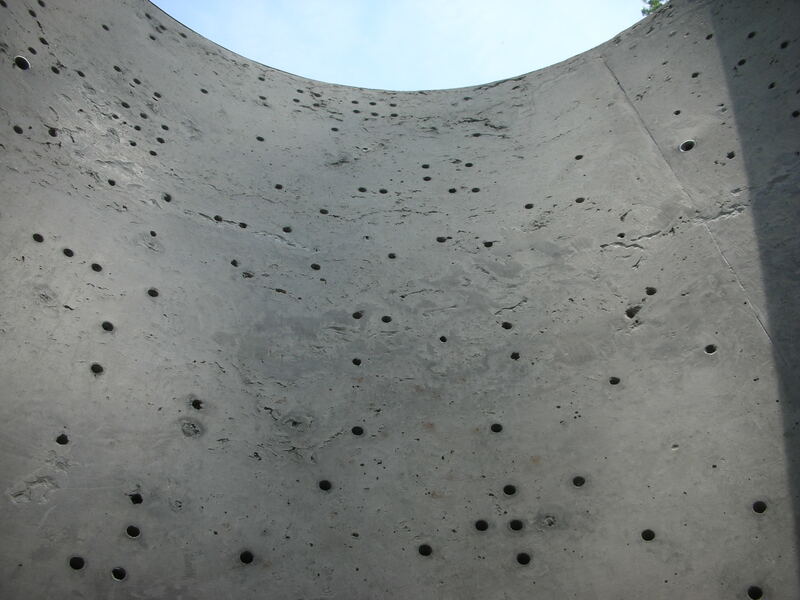 Photo two shows the finished item with pins removed, revealing the bullet holes which allow small shafts of light into the column. 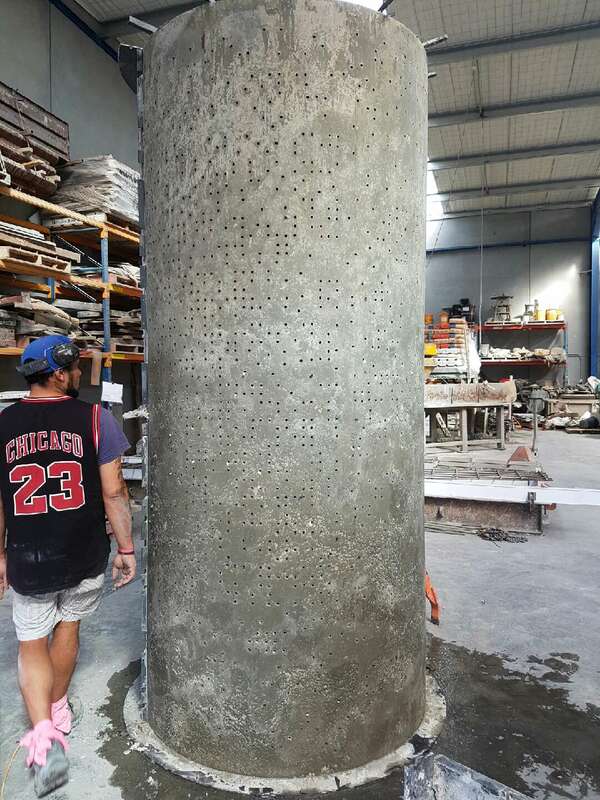 It was decided to cast the Remembrance Column in one piece after all rather than in sections and it will be safely transported in a specially made steel cradle inside the shipping container. 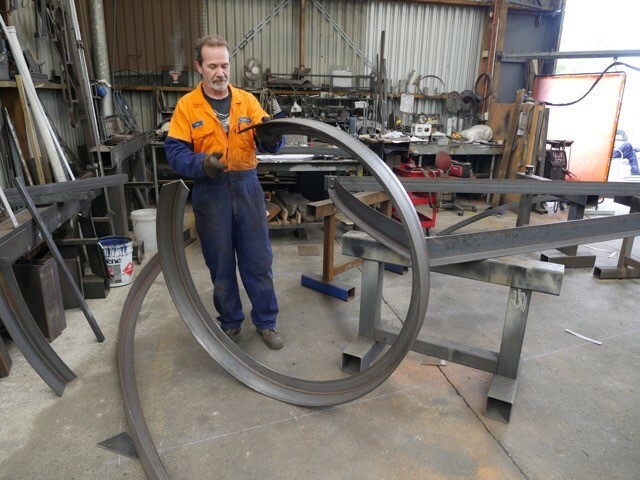 NZ based manufacturing of the memorial is well underway and on schedule for shipping to Belgium in March 2017. Practical completion of the project is scheduled by end of July 2017 in time for the official centenary commemorations in October 2017. 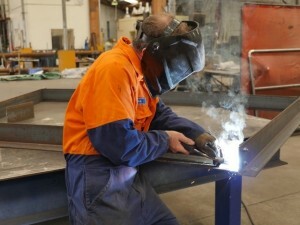 Photographs of various aspects of manufacturing have been circulated to Board members. Other photos will follow over the next few weeks and these will be added progressively to the Society’s website. 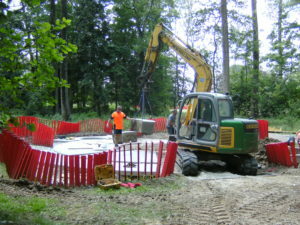 It is also intended to provide a presentation on progress with the project at the AGM on 30 March. The Official Opening: Discussions are proceeding with NZ Embassy officials in Brussels (in particular Deputy Ambassador Andrew Gillespie and Military Attaché Captain Shaun Fogarty, RNZN). They met with Belgian representatives in Zonnebeke late last week and we expect to hear the outcomes of this meeting shortly. Timing of the official opening event is yet to be finalized. Principal options being considered are mid-afternoon on 12 October 2017 or late afternoon on 11 October 2017. 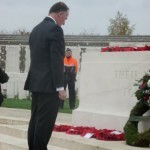 Preference is expected to be given to the latter and this would avoid cluttering the already busy schedule on of events on the 12th while providing the opening the status of ‘curtain raiser’ for the series of NZ commemorative events which would follow. 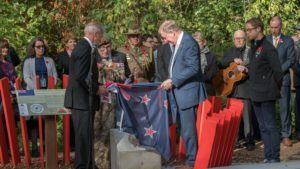 An opening ceremony late on the 11th would precede the 7.30pm Menin Gate ceremony which on 11 October 2017 will be especially dedicated to New Zealand. Arrangements have been made for soil to be provided from the intended site of the Belgian Memorial at Pukeahu in Wellington to be sprinkled on the NZ garden at Zonnebeke during the opening ceremony. Further details of the official opening will be made available for members as planning proceeds. Farewell Blessing Ceremony: Arrangements are under way for a proposed dawn ceremony outside AWMM to farewell and bless the three loaded shipping containers carrying the NZ manufactured components to Belgium. The actual date for loading the ship is yet to be confirmed but the ceremony is currently proposed for 7 March 2017. Details will follow shortly. 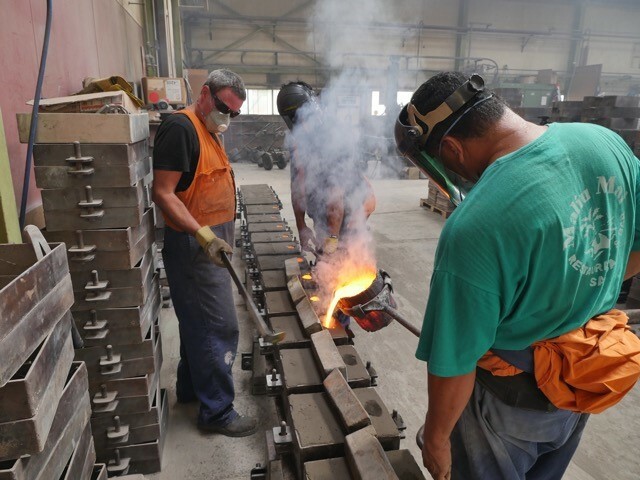 The two photos are of manufacturing the large bronze letters at Skellerns in Avondale and the formwork being made at Amediate Engineering in East Tamaki. 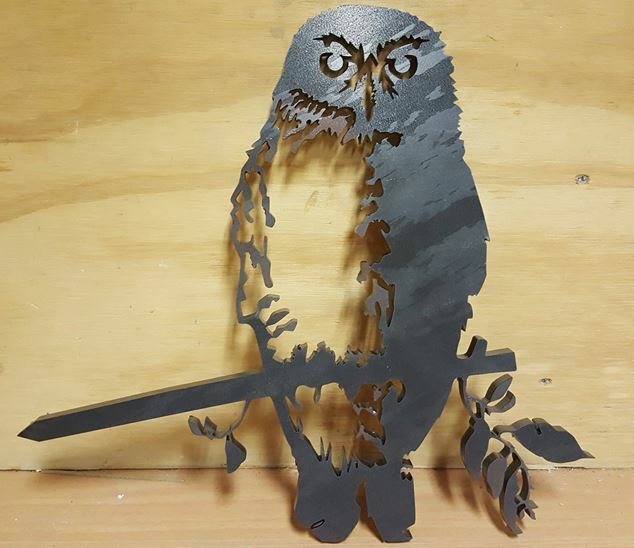 The Hon. 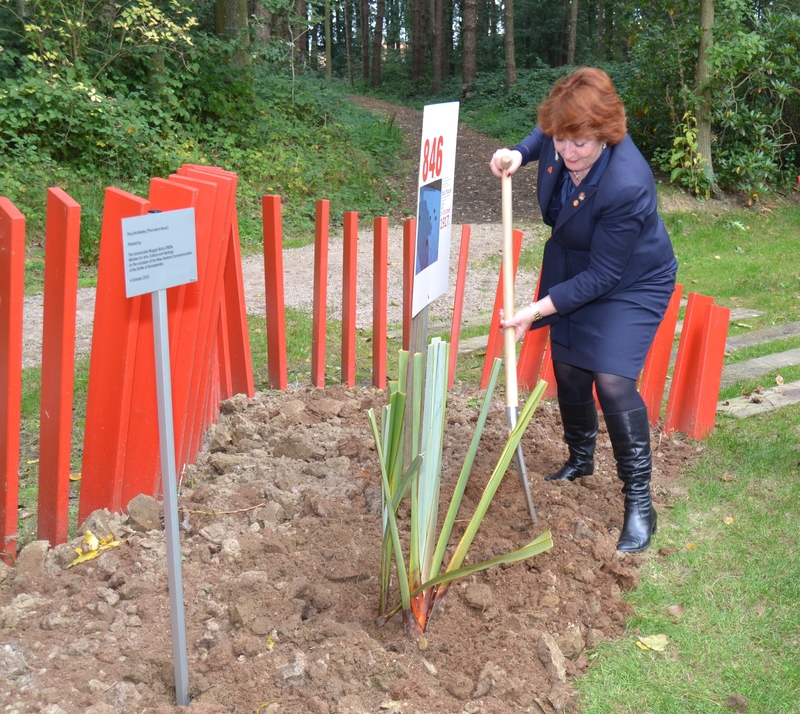 Maggie Barry MP, Minister for Arts, Culture & Heritage visited Flanders in October 2016 to unveil the new Memorial at the bottom of Bellevue Spur dedicated to all those that lost their lives during the Passchendaele Offensive. The monument is a large scale version of the Nga Tapuwae sign as seen on the Wellington waterfront and depicts the battlefield as viewed from that spot on October 12th 1917 – to recap the New Zealand Division’s involvement in the push towards the village of Passchendaele resulted in our worst day in Military history recorded on 12th October 1917 when we lost 846 of our men on Bellevue Spur on just one day during the Passchendaele Offensive! 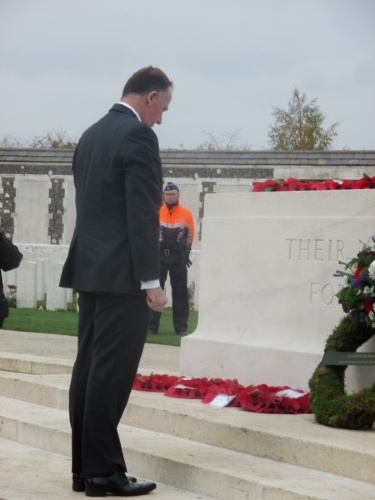 Former prime-minister John Key also visited Tyne Cot Cemetery (but not the New Zealand Memorial & Garden) while he was in Belgium on the 29th October 2015 to present an Honorary Member of the New Zealand Order of Merit to our own Freddy Declerck.